Hundreds of people demonstrated outside U.S. Rep. Dave Reichert’s district office in Issaquah on Thursday, demanding he face constituents at a town-hall meeting. 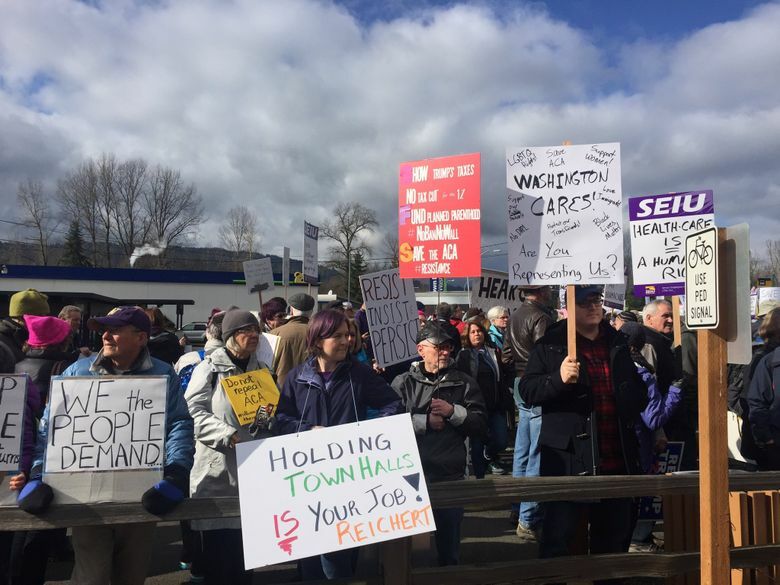 Several hundred people demonstrated outside U.S. Rep. Dave Reichert’s district office in Issaquah on Thursday, demanding he face constituents at a town-hall meeting. But Reichert, calling town halls “not productive,” went ahead with plans to take questions via a Facebook Live interview instead. Marching from an intersection near a suburban shopping center, protesters taunted the Auburn Republican and former King County sheriff for his steadfast refusal to hold a town hall during this week’s congressional recess — or any time. Some carried signs saying “What are you afraid of?” or “Impeach Trump” and imploring the GOP save the Affordable Care Act (ACA), also known as Obamacare. Issaquah police Chief Scott Behrbaum estimated the crowd size at more than 500. Darnell Parker, of Covington, a member of the SEIU 925 union, led the demonstrators with loudspeaker-amplified rhymes. Neither Reichert nor his staff emerged from his district office, which was cordoned off with yellow crime-scene tape and guarded by police. During a Facebook Live interview Thursday afternoon with veteran KCTS 9 journalist Enrique Cerna, Reichert held firm on his opposition to holding a traditional town hall. He said he would continue to answer phone calls and hold small group meetings, but that he also had security concerns for his staff when it came to town halls. In the nearly hourlong interview, Reichert, at times, distanced himself from Trump, reiterating that he did not vote for the president, while also defending some of the new administration’s actions. He defended recent votes to neuter the Office of Congressional Ethics and to decline to seek Trump’s tax returns. He offered no opinion on the push to defund Planned Parenthood and Trump’s directive withdrawing federal protections for transgender students, saying both issues would be left to the states. Earlier, the crowd outside his office focused much of its concern on health care. Dianne Niemann, of Issaquah, said that while it may be uncomfortable, Reichert owed it to his district to face questions in person. “I say open up and talk to people,” she said. Mardie Rhodes, of Sammamish, said she worked at health-care clinics for years and witnessed people cry when they obtained health insurance under the ACA, which Republicans have vowed to repeal and replace with an as-yet-unspecified alternative. Like other protesters interviewed Thursday, Rhodes was not a Reichert supporter, but said that should not stop the Republican from answering her questions at a town hall. “We’re in contentious political times, and I think that it’s more important than ever to meet face to face,” she said. The town hall demands on Reichert come as Republican politicians’ town halls across the nation have been flooded with protesters challenging the agenda of Trump’s administration. Some Republicans have dismissed the movement as the work of disgruntled Democrats. Thursday’s protest at Rei­chert’s office was, in part, organized and promoted by the Seattle-based, Democratic-allied activist group Fuse Washington. While the protesters vowed to make Reichert pay next year when he’s up for re-election, Democrats have never held the 8th District’s congressional seat since it was created in 1983. The district grew more safely Republican in the last round of redistricting in 2012. It now stretches from east King and Pierce counties across the Interstate 90 corridor to include the more conservative Chelan and Kittitas counties. Reichert was re-elected last year with 60 percent of the vote. It’s not solely Republican officeholders under pressure to have town halls. Washington’s Democratic U.S. Sens. Maria Cantwell and Patty Murray also have avoided such events. That has led some constituents to organize one for them. They’ve planned a town-hall event for Seattle on Saturday and invited the senators, who have declined. The group Seattle Indivisible plans to hold the event anyway. The town hall is set for 6:30 to 8:30 p.m. at Seattle Unity Church, 200 Eighth Ave. N.